A supernova remnant in the Large Magellanic Cloud about 160,000 light years from Earth. The companion star is visible on the left-hand side of the cloud, just below the white/purple area. The purple is X-ray data from the Chandra X-Ray Observatory, and the yellow and cyan optical light captured by the Magellanic Cloud Emission Line Survey in Chile. 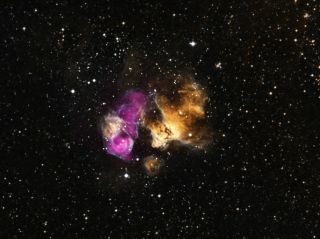 A lucky star somehow survived the explosive death of its stellar companion, new images reveal. The explosion, known as a supernova, would have been visible from Earth several thousand years ago. While the supernova remnant (called DEM L241) has been known since the 1970s, the companion star remained invisible until NASA's Chandra X-Ray Observatory recently examined the region. Scientists explained the hard-to-kill star's supernova survival in a video. This labeled image shows a star that has survived a nearby supernova explosion in the Large Magellanic Cloud about 160,000 light-years from Earth. The purple is X-ray data from the Chandra X-Ray Observatory, and the yellow and cyan optical light captured by the Magellanic Cloud Emission Line Survey in Chile. Scientists located the star while examining DEM L241, which lies about 160,000 light-years away in the Large Magellanic Cloud, a small galaxy neighboring our own Milky Way. The supernova remnant itself is very bright in X-rays, indicating it's still hot. While it's unclear what remains of the star that exploded, scientists suspect it is either a black hole or a neutron star (a tiny and extremely dense stellar core). This remnant is locked in an orbital dance with the young massive star that is slowly tearing the star apart, researchers added. "As they orbit one another, the dense neutron star or black hole pulls material away from its companion star through the wind of particles that flows away from its surface," NASA officials stated on the Chandra website. "If this result is confirmed, DEM L241 would be only the third binary containing both a massive star and a neutron star or black hole ever found in the aftermath of a supernova." Besides revealing the hidden companion, Chandra's observations found that the supernova remnant includes oxygen, neon and magnesium. This information, along with the existence of the nearby massive star, suggests that the exploding star had a mass between 25 and 40 times that of the sun, researchers said. "Indirect evidence already exists that other supernova remnants were formed by the collapse of a star to form a black hole," NASA officials added. "However, if the collapsed star in DEM L241 turns out to be a black hole, it would provide the strongest evidence yet for such a catastrophic event." This means that in the distant future, the binary system may become either two neutron stars, two black holes, or a black hole and a neutron star orbiting each other. A paper based on the research, led by Fred Seward of the Harvard-Smithsonian Center for Astrophysics, was published in the Astrophysical Journal in November 2012.